The Fanex 904C and the New 1124C are carrier frame tedder purpose-built for use with smaller tractors. The wide track width ensures stable running characteristics during road transport. 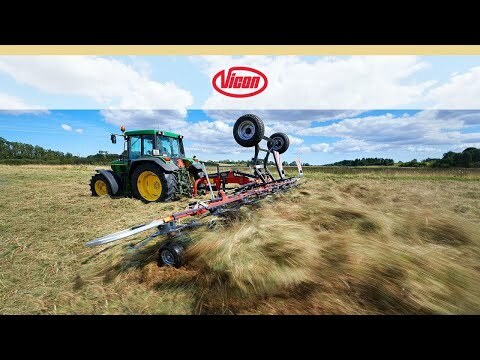 Due to the carrier frame concept, the lifting capacity of the tractor is not a limiting factor and it can be operated with tractors starting from 70hp. Maintenance-free driveline and strong ProLine gearboxes. Central adjustment for border tedding – all set from the tractor cab. Strong and sturdy design with closed V-shaped central unit. Gearbox does not serve as part of the main frame, but is bolted on. No strain is transmitted to the gearbox. Permanent oil bath lubrication – no maintenance of the gearbox required. Dust and water proof gearbox design. No corrosion. Double bearing on both sides of the drive shaft for highest durability to withstand the most severe conditions. Crown wheel and pinion positioned in one housing for very reliable drive. Powered by maintenance-free driveline and gearboxes. Reliable driveline with a strong combination of maintenance free universal joints and HexaLink finger clutch. Hinges are connected with strong maintenance-free roller bearings for extended longevity and stability of the connection points. To increase productivity, all mounted tedders are Standard equipped with a mechanical border tedding device. All carried tedders (904C, 1124C, 1404C) have standard hydraulic solution for border tedding. A marker cleverly shows the position of the axle. Electro-hydraulic Control of main functions with simple Joystick (optional).